Dinner at Christina's: Blogger Secret Ingredient - Unveiled! I am SO excited to be hosting the BSI contest this week!!! Thanks for choosing me, Laura! Since I've secretly been wishing I'd be chosen to host, I already dreamt up a few ingredients, just in case the honor was ever bestowed upon me to actually choose. Once I learned I'd really be hosting, narrowing down those ingredients at first seemed hard, but then I considered a few things and my mind was set! I chose the ingredient because it is accessible to everybody and is very affordable. I think a lot of people overlook this ingredient's flavor and versatility. Which, I think is unfortunate, because it's something I love and hope to gather new ideas and recipes from your submissions. It's also the perfect week for this ingredient, since St. Patrick's Day is Tuesday. So, without further ado... I chose cabbage! According to the World's Healthiest Foods' page on cabbage, among other things, it is an excellent source of phytonutrients, which help promote detoxification within our bodies. It's also only 33 calories per 1 cup of boiled cabbage! 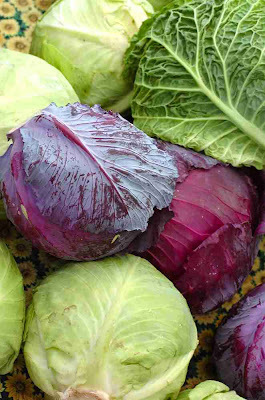 Recipes utilizing green or red cabbage can be submitted to christina at dinneratchristinas dot com through midnight (Central), Sunday, March 22nd. There are two ways to submit a recipe to me: (1) if you have a blog, email me the link to your post, (2) if you don't have a blog, email me the recipe and a photo and I'll post it. And, finally, the prize!!! Ahhh, the prize. You didn't think I'd forget, did you? It's the most important part! The winner may select 1 lb. of their choice (up to $12) from Nuts Online. Don't let the name fool you- they have a great selection of not only nuts, but also dried fruits, candies, snack mixes, coffee, tea, seeds, spices, and even some grains! The winner will also get a $10 Amazon gift card, because no matter where you live, they're available to you, and you can find anything on there! Good luck everybody and Happy St. Patrick's Day!!! HOORAY!!! I have half a cabbage just DYING to be cooked!!! I just posted mine. Thanks again for hosting!! Hi, I just posted my recipe.